The United Nations first recognized an annual Day of Peace in 1981. It was fixed on September 21 in 2001. In 2004, the World Council of Churches began recognizing September 21 as an International Day of Prayer for Peace. Across the world, 280 million people were aware of September 21 as a day of peace in 2012. This year we are inviting each congregation to develop a Peace Day prayer event designed around what is going on in our world and in your own communities. Observe the UCC's first ever Just Peace Sunday on September 20. Offer individual prayers and organize community-wide prayer services in your city and congregation. Find and register events on the Peace Day Blog. Learn more about planning your event, and post what you plan on doing this year on our Peace Day Facebook group. From September 15-21st pledge to join a Media Fast with the UCC’s OC Inc. The World Council of Churches invites all to participate in World Week for Peace in Palestine Israel. The Day of Prayer for Peace also falls within the Time for Creation, a reminder of the close connection between peace on Earth and peace with the Earth. Support all the many efforts to mark September 21st as Peace Day! “Pinwheels for Peace” has evolved into a children’s movement. This year, the United Methodist Publishing House produced a peace curriculum for children – 5 lessons in Grow, Proclaim, Serve. The first lesson has been made available to you. Use it to teach your children the Biblical understanding of Peace, lead them in making pinwheels, and help them observe International Peace Day 2014. Their pinwheels are a visible witness to the children’s call for world peace. - Learn more about the “pinwheels for peace” movement. Join the United Church of Christ’s media justice ministry and the movement against violence by pledging to use only violence-free media on Sept. 15-21. Help honor the International Prayers for Peace Day foster peace in our communities by supporting media that doesn't run on violent images and messages. Great activity for Just Peace churches. Resources include bulletin flyers, information about violence in media, activities for teens and youth. 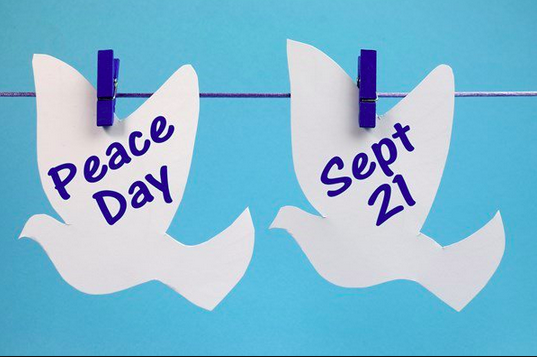 Take up the Peace Day Challenge with the U.S. Institute of Peace! The U.S. Institute of Peace, our nation’s independent federal institution dedicated to peacebuilding (which was established in 1984 in part thanks to UCC efforts), has created the Peace Day Challenge to raise awareness of International Peace Day. USIP aims to raise the visibility of this day, to frame peace as an attainable alternative to the violence we see daily in the news, and to encourage individuals and communities across the U.S. and beyond to take an action for peace, to share it at #PeaceDayChallenge, and then to sustain it beyond the day. Learn more, and get involved at www.peacedaychallenge.org! Because Peace is Action, and it starts with You! Offered by Rev. Ken Sehested, Circle of Mercy Congregation in Asheville, NC. That the God of Scripture manifests special concern for the cries of the poor, of the marginalized, the outcast, indeed all who have no access to the table of bounty. We also believe that if the people of God are to be faithful to our calling, we will locate ourselves in compassionate proximity to those whose lives are battered, bruised and broken. We do so not as an ethical demand or a work of righteousness but as a spiritual discipline. For we believe that God’s presence and voice are most easily recognized and understood in situations where life has been abandoned. Where hope is in retreat, where death is on the prowl and despair rules. Repent of your habits of violence and injustice; return to the One who bore you in mercy. Rebuild ruined neighborhoods; restore marginalized peoples; resume the politics of forgiveness and an economy of manna*. Revive an ecological relationship with the created order, reject the escalating culture of violence, and renew your commitment to building a culture of peace. We lift our hearts to you, O Christ. Make us instruments of your peace. Merciful, loving and all powerful God we come into your presence with hearts of thanksgiving and praise as we unite for world justice and peace. We pray for peace among people of various cultural traditions that are different from our own. We pray for peace and justice within our communities, our individual nations and throughout the world. We pray for the youth around the world. That they will come together to positively enrich their lives, their communities and their countries as was exhibited in the Jamaican Community Center project. We pray for global economic and political solutions to situations that will bring peace and justice to all of God’s people, created in God’s image. We offer these prayers in the name of Jesus and for His sake. Our God and Creator, who made us to be your family throughout the earth, we give you thanks for the expansiveness of your love. We rejoice that you have included us all in your compassionate embrace. We praise you that you have spread wide the unseen arms of your eternal, welcoming kindness. Forgive us our failure to reflect your way in our own lives. Often we do not spread our arms wide. Often we keep our compassion in much too small a circle. Often our love has been constrained and restrictive. Open the eyes of our hearts that we may see brothers and sisters where we previously had not seen any. Help us to breach walls build by ignorance, suspicion and hate so we will draw near to one another, as you have drawn near to us in Christ. Lead us that we might reject animosity and instead promote harmony. Help us, O God, that what we say and do will further the grace you have extended to us as we reject the ways of harm and advance those things that add to the health and hope of all creation. Amen. Your Shalom. Deep peace. Just Peace. We pray for a peace that is beyond our understanding…beyond our limited vision, hopes, and dreams. We pray for an end of the reign of violence in our communities and in our world. We pray for an end to war. War that kill our people, desecrates our Earth, depletes our resources and our joy. We pray for an end to poverty that keeps millions from living lives of dignity, lives without basic needs. On this International Day of Prayers for Peace, let us join with all of God’s creation to pray for Shalom. Your Shalom. Deep peace. Just Peace. For the peace that can only come from You.